Working construction or any outdoor project can be a challenge during the winter months. Some days it’s freezing and others it’s just dark and cold with very little sunlight. When the temperature drops, the ice forms, and the snow begins to pile up, it doesn’t change the fact that for you and the crew on your jobsite there’s still work to get done. To remain safe and keep warm, use the tips in this article to protect your jobsite crews from cold weather this winter. Working in the winter weather for long hours at a time can be dangerous to the health of your crew. Naturally, everyone faces the same threat of cold-related illnesses and even accidents. You can minimize these conditions for your jobsite by practicing caution, safety, and preparation. These practices can vary depending on the current status of the jobsite or the project your crew is working on. If your project already has heating systems and components in place but unused, have an HVAC professional perform maintenance on the building so that it can be used while your crew works. Additionally, have your crew seal the building by winterizing windows, doors, and sealing any areas with gaps that can cause uncomfortable drafts and moisture damage. Furthermore, don’t forget to check the roof if applicable. If you’re restoring an old home, minor roof damage can become worse and collapse if the snow piles on hard enough. Take care of your roof and any other structural issues to avoid injury. If your crew is working on a new project without a ton of infrastructure in place and limited electricity, maintain a healthy work environment by keeping the jobsite as comfortable as possible. The best way to do this is using a convection gas fired heater. These heaters can cover up to 600 square feet keeping your crew warm and job productivity high. Space heaters for jobsites such as this are economical and safe for your crew as their powered by liquid propane and have an auto shut-off safety feature. Don’t forget to frequently remove snow when present and use deicer to keep ice from forming. If electricity is limited, use a high-quality generator to keep tools fired up to prevent any loss of productivity or power while working. Never hesitate to encourage your crew to always wear protective apparel. Cold temperatures can decrease circulation where it matters for your crew such as fingers and toes. Everyone on the job should be using gloves, water resistant boots, and base layers or thermals to keep their extremities warm and dry. Finally, the last tip to protect your jobsite crew is to have them work in pairs for accountability and safety. Workers should feel supported in a way that they understand someone is always looking out for them. Accidents and cold-related illnesses can happen fast and quickly turn into life-threatening situations. Something as small as not spotting ice on a ladder can lead to something very dangerous. Make sure your crew works together so that early signs of trouble can be identified and handled before anyone gets hurt. I’m sure working in the cold is not ideal for most. However, if you’re the man or woman in charge it’s your duty to protect your crew and keep everyone safe no matter what. 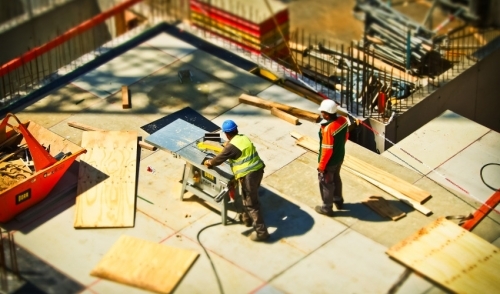 Take advantage of these tips and maintain a healthy work environment on your jobsite today.